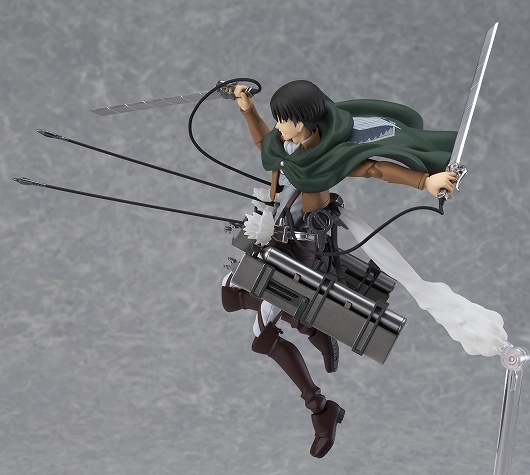 Mr. Machida introduces figma Levi from the ever-popular “Attack on Titan” series! Out soon! Mankind’s strongest captain!! I wonder if it’ll snow in Tokyo today? Machida here, trembling with fear that the weather will be like that from now. Please be careful and take precautions for the weather from tonight until tomorrowー. Well then, without losing to this weather, I’ll be introducing this product that will have information available from tomorrow. I shall introduce the captain that’s touted as mankind’s strongestー. Captain Levi, who is known to have the strength of one brigade (about 4,000 people). A former thief who has a sharp tongue. He was wounded while saving Mikasa during the fight against the Female Titan. One part of his personality is caring for his subordinates. Wrists that can reproduce his trademark reverse grip of holding the 「ultra-hard blades」 are includedー. As for the 3D Manuever Gear, the 「wire anchor」, 「emitting effects」, and 「smoke effects」 are also included. The 「smoke effects」 can be attached by inserting them into the pedestal, so look forward to all of the different poses you can do! 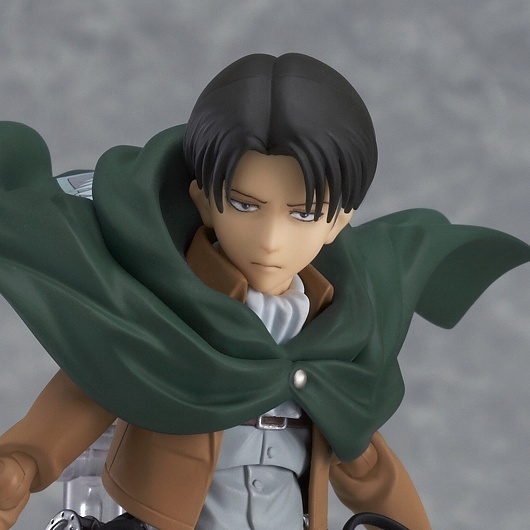 He comes with 3 expressions, and the one earlier was his 「normal face」, and this one is his 「clenched teeth face」! You can use this primarily for action scenes. 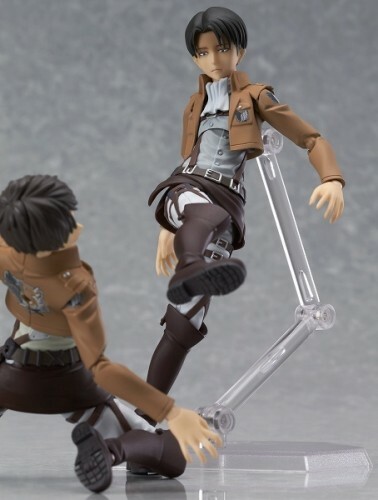 Since the 3D Gear is detachable, you can reproduce the trial scene where he kicks Eren…! Please be as violent as you want! Information for figma Levi will be scheduled for tomorrow around noon. 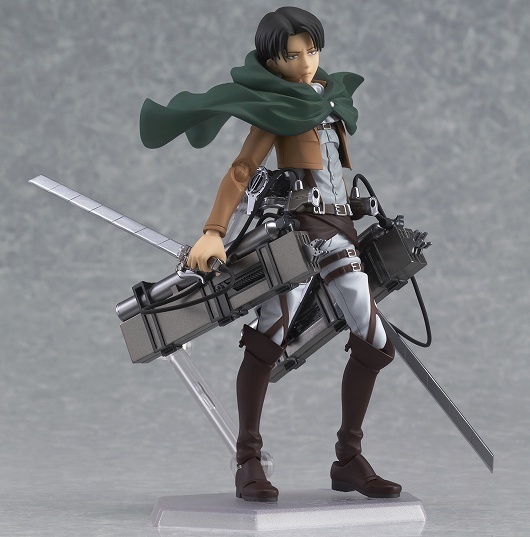 The price, including tax, is 4937 yen, and it’ll be on sale approximately in June of 2014. 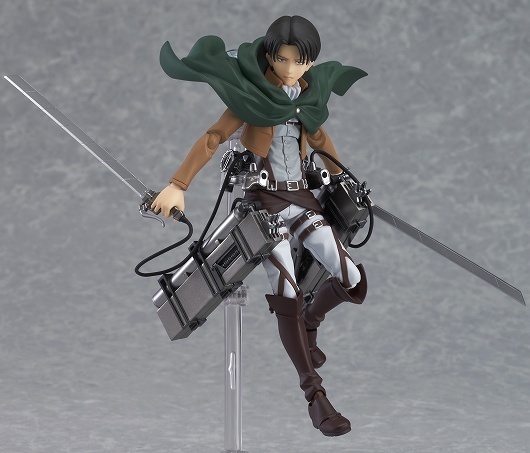 Please put Captain Levi together with figma Mikasa & figma Eren!! 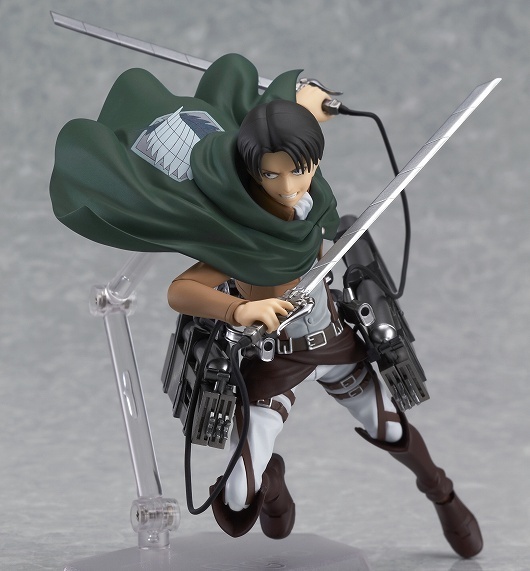 Tagged Attack On Titan, Captain Levi, figma, Good Smile Company, 進撃の巨人.